The U.S.-South Korean alliance faces significant challenges caused by transitions in both countries, including political and demographic change in South Korea and fast-paced adjustments to America's national security strategy in the face of a new global and regional strategic landscape. Unfortunately, due to sales rights restrictions, we cannot offer Alliance Diversification And The Future Of The U.S.-Korean Security Relationship for sale in your country. The U.S.-South Korean alliance faces significant challenges caused by transitions in both countries, including political and demographic change in South Korea and fast-paced adjustments to America's national security strategy in the face of a new global and regional strategic landscape. These are stressful circumstances, but they also present opportunities for improving alliance relations. Careful planning and effective communication at various levels (including the public level) is needed to minimise the stress and to capitalise on the opportunities. 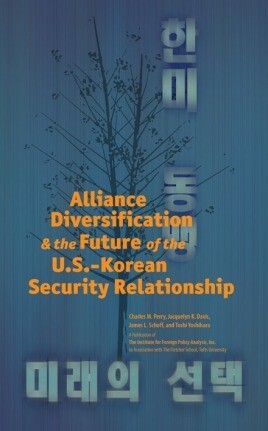 The study examines the complex dynamics at work and explores how U.S. policy makers can work with their counterparts in Seoul to diversify the alliance and prepare it to better serve the national interests of both the United States and a future united Korea.